Microsoft, finally, updated the update history support page for Windows 10 version 1809 on the company website. The page highlights the network mapping issue that users may experience after installation of the new version of Windows 10 and two additional issues that we did not have on the radar up to that point. The network mapping issue prevents mapped network drives from reconnecting to the Windows 10 device on start. Microsoft published workarounds to address the issue while it is working on a fix that resolves it. Comments here on this site suggest that the issue is not affecting all devices upgraded to the new feature update for Windows 10. If you feel lucky, you could upgrade and see if the issue is present, and downgrade or use one of the workarounds if it is. Microsoft put an upgrade block in place for certain hardware and software configurations. 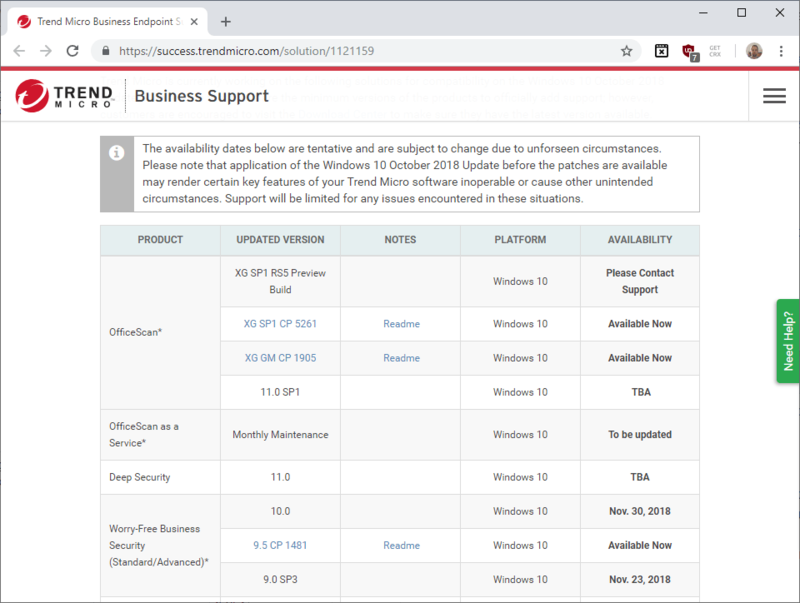 The Trend Micro products OfficeScan, Deep Security, Endpoint Encryption, Vulnerability Protection, and Worry-Free Business Security, business endpoint security products, have compatibility issues and devices that run any of these products are blocked from receiving the October 2018 Update for Windows 10 for now. Trend Micro published a support page that highlights when updates for the mentioned products become available. Updates for some products that resolve the compatibility issue are already available, others will become available later this month or are listed as TBD. Installation of the feature update without installation of these updates may " render certain key features of your Trend Micro software inoperable or cause other unintended circumstances" according to Trend Micro. Administrators who install the new version of Windows 10 via an installation package get a notification during setup that informs them about the issue and the requirement to install updates for installed Trend Micro products before proceeding with the installation of the upgrade. Microsoft blocked devices with AMD Radeon HD2000 and HD4000 graphics processors from receiving the Windows 10 version 1809 update. The hardware devices are not supported by AMD anymore. While it is possible to upgrade to Windows 10 version 1809 on devices with these hardware configurations, users may notice issues during day to day operations. Microsoft Edge tabs may stop responding according to Microsoft, and the error message "INVALID_POINTER_READ_c0000005_atidxx64.dll" may be displayed to users in these situation. Microsoft notes that users may experience performance issues with the "lock screen or the ShellExperienceHost" as well. Microsoft updated the update history page for Windows 10 version 1809 recently with additional known issues. The last Two Win10 Updates have been a total disaster for many users, myself included. I just reinstalled Win10 Pro for the Final time and will avoid any further updates at all costs. I got the October re release of 1809, or was that re re release, which took well over an hour to download and install only to get the same BS errors that plagued 1803. DNS errors!! While the Browser(s) would load, could not get any websites to open, in spite of flushing the DNS! Now, I read about other issues with 1809, so that’s it! Enough already! Sincerely, what a shame considering all the money and development staff they have! What it looks like is that Windows 10 was released as an incomplete beta and they planned to steadily update it as they went along. This would justify their “Windows as a service” strategy. But then in typical Microsoft fashion they decided they could cut their QA staff while at the same time increasing the update schedule. Looks like MS management was blissfully unaware of how many issues Windows actually has always had. The worst part is that they forced downloads of untested updates on customers with no way to opt out. I work for a managed services provider that has Trend Micro Worry-Free products installed on 3,000+ endpoints across our business partners. The compatibility issues with Trend Micro is nothing new. Each time Microsoft releases a new build for Windows 10, Trend Micro has always recommended holding off on upgrading until their enterprise grade products fully support the latest build. We have seen a number of issues when running an unsupported version of Trend Micro on the latest build of Windows 10. These range from the Trend Micro agent not starting to BSODs. Ultimately, Trend Micro will release a patch that fixes these issues, we apply the patch, and the issues are gone. Nevertheless, Microsoft really needs to get their act together with the quality of their new builds. I heard that the last issue that Microsoft had with the October Update, the one where files were being deleted, was a known issue among the Insiders, but Microsoft failed to properly address it before releasing the update. Fortunately, as a company, we have agreed to remain one Windows build behind the latest Windows build. We have found it to be safer, and it creates less issues for us and our business partners that we service. It has always been best practice with Windows to avoid upgrading until the new version has been around for long enough that Microsoft has fixed the major issues with it. This remains best practice with Windows 10. That’s one of the reasons why Microsoft’s policy of forced upgrades is so awful. It’s Microsoft forcing you to put yourself at risk. I will not disagree with this since each build of Windows 10 comes with its own security enhancements and improvements. By safer, and I should have been more clear, I meant stable and reliable. Win 10 should be renamed Fail 10. I’ve said it before and I will say it again, lock your updates to 1709. If you want Windows 10, for whatever reason, your only options are 1507, 1607 or 1809. @Anonymous – I see your comment as an indictment of the design of Trend Micro, although it is probably not your intention. To me a history of this problem when Windows is updated implies Trend Micro needs to redesign their product to retain their perceived advantage while acknowledging Windows design and convention. Nope, it was not my intention at all, but I do agree with your comment. What a nice thing… Force the user to “upgrade” their OS a couple of years ago and now have them no longer receive security updates. They can’t fix compatibility so now the plan is to fracture the OS? Does this make any sense professionally? Trend Micro is popular software in the enterprise environment, so why don’t things work? Something just doesn’t feel right here. The depreciation of hardware by m$ as time goes on is not a good sign for the future, what gets deprecated next, network cards, motherboards? It seems windows is on a downward spiral but hey at least they added ray tracing and vr, because priorities. I just configured a couple of Dell laptops with v1709. Rather than do a clean install, a mistake I won’t make again, I did the upgrade, for 7 HOURS!!! I uninstalled all software before the upgrade. Upgrading through the Settings panel, windows installs a whole list of 1709 updates first, WHY? It should offer the 1803 upgrade and if deferred then offer the list of 1709 updates. Make sense to you? It seems like there are only a handful of people on windows 10 QC, what a joke. As time goes by windows 10 is becoming one headache after another. Trend Micro had 6 months of testing to be compatible with 1809. It is NOT Microsoft’s fault. The rather large company I am retired from uses Trend Micro Officescan. And they have updated between 60 and 7% of their PCs to Windows 10. I am not sure of the version. But chances are good, based on past experience, they are back on 17xx. They never did use Windows 8. I have passed on this information to someone I am still in contact with. Funny thing is, this person is currently working with Microsoft in their Mississauga office. He did not say if this was Windows related. In my days with the company, I worked with Windows Embedded on over 9000 devices province wide. My son now works there … developing a new embedded device with …. (drum roll) … embedded Linux. I could see the company pulling the plug on Windows and moving over to Linux if this Windows 10 fiasco continues. You’d think after fifteen years Microsoft could get networking to work, but apparently it’s as hard for them as getting their updates to work. So far been lucky couple old Haswell desktops upgraded just fine. Did have a Dell 3847 not have audio until finishing setup though. Performed clean installs on those and my XPS 9360 and all is well so far. Other then I did notice Spotlight for lock screen not updating picture. A minor issue that has happened before with updates. Find it odd that HP has yet to release model list for 1809 compatibility while Dell has had this posted for some time. If that means anything or not? About AMD cards, my cousin got severe issues with an AMD Radeon R2 APU on W10 1709 version and also 1803, so probably R2 APUs would be delayed to receive 1809 upgrade too. For me, 1709 worked through it’s entire cycle of life with only rare issues, none major.. and 1809 has not worked well at all in the past week it’s been installed. Firefox can no longer be used as it freezes the machine, and I’ve tried versions as old as 59 and also ESR releases.. no dice. I have to use Pale Moon browser (old Firefox fork), but addons are an issue with this browser. Vivaldi works too, just not Firefox. I have an unusual setup for sure, two displays and 2 GPUs, use Aida64 SensorPanel on a small 9″ 3rd panel, and use AWM to manage the screens and taskbars. I’ve been dealing with this because I really need the dark explorer as my eyes are really starting to bother me. I’m hoping 190x will be better. BTW.. Saying 1809 has been working great for you since the whole month it’s been available.. doesn’t really tell us anything. The people that are having issues aren’t going to care about someone that isn’t. I suppose if you install this OS out of the box and don’t change anything it’ll be just fine. Those of us in the real world know better. Win 10 Home or Pro is not for those who do not like to be forced auto-upgraded every 6 months(= for Home) or every year(= for Pro); to be forced auto-updated and rebooted every week or every month or every 90 days(= for Pro); and to be forced Telemetry & Data auto-collected every second or every minute by M$. Those who like to be forced by M$ to be done by the above(= technology slaves.?) are welcomed to use Win 10 Home or Pro. Bear in mind that all this forcing in Win 10 by M$ is mainly to profit-gouge her trapped enterprise-users or to milk her cash cows as dry as possible, ie companies can no longer buy and use Win 10 Ent for up to 10 years – previously they could do so with Win 7 Ent. Win 10 Ent can only be used for 10 years if the companies with Volume Licensing(= minimum 5 Ent licenses) have bought additional Software Assurance or annual subscriptions or the Ent LTSB edition(= US$300 per Ent LTSB license). As for Win 10 Home & Pro, M$ will likely use forced processor-blocking auto-updates to make obsolete 5 year old computers, likely post-Jan 2020 – the EOL for Win 7. Thereafter, M$ will likely force all Win 10 users onto annual subscriptions = WaaS, ie perpetual Win 10 and Office licenses can no longer be bought = can only be subscribed, like your Internet and smartphone bills. The way to cook a frog alive is to put it into a pot of cool water and then very slowly heat up the pot to a boil. Putting a live frog into a pot of warm or hot water will cause it to immediately react “negatively” by jumping out of the pot. This seems to be what M$ is doing with Win 10 users, ie slowly cooking them alive. FUD.? Maybe. But the inalienable fact is that M$ is not your friend. If it’s later proven(post-Jan 2020.?) that the pot of cool water will not get hot, the smart frogs can jump back right in. This isn’t actually new as far as I can tell. I’ve been experiencing this bug for months on 1803.
i don’t know.. but i think many programs don’t get updated properly to ensure compatibility right off the block, especially security software. it’s not for an os to make itself compatible with a program, but rather a program to make itself work for an os version. the trendmicro and amd/ati thing aren’t really win10 issues that’s the fault of ms. They are just making fun of those windows 10 fanboys now. Its really amusing. Say hello to Linux or BSD.